Spectacular and moving tribute to Harrogate's WW1 dead - St Wilfrids Church on Duchy Road lit up in poppy red. How much is enough? When it comes to remembering the dead I’m not sure there’s a right answer. There were some incredible scenes – and incredibly moving ones at that - over the Armistice Day weekend. None more so than in Ripon where the city was decorated with a sea of poppies; 55,000 in total. Its historic cathedral, meanwhile, with some parts dating back to 1160AD, was turned into a stunning gigantic visual tableau with WW1 footage of soldiers on the frontline. 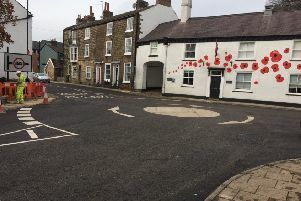 Such a fantastic effort did this ancient city make, there were mutterings among some in its bigger neighbour of Harrogate that the latter had been found wanting in its commemorations compared to the former. It didn’t feel that way if you were inside the spectacular architecture of the town’s grade 1 listed St Wilfrid’s Church. Harrogate had plenty going on to mark the 100th anniversary of the end of the Great War – from the traditional public ceremonies in the town centre and Stonefall Cemetery to special events such as the Parry Centenary Concert in the Royal Hall tonight . But if it had any sort of focal point, it was at St Wilfrid’s Church on Duchy Road. It wasn’t just that it had gone to the trouble of researching the personal stories of all 17 of the Harrogate soldiers who went to the Great War and never came back. Or that it had worked with local schoolchildren to create jam jars with lit candles for every single name on the town’s main war memorial. It was the way the church brought the whole community together in a town successful enough not to feel the need of a common hub. As venues for election results go, the Hotel du Vin was one of the better ones I’ve been to. I suppose it wouldn’t have been appropriate to announce the result of the ballot of Harrogate town centre businesses on whether to form a Business Improvement District in a greasy spoon café. 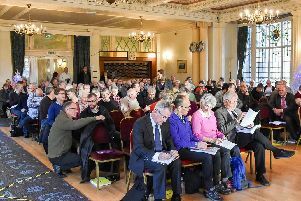 Amongst the gathering of expectant figures from the Harrogate business world, one constituency was noticeable by its absence - the smaller independents. Before anyone cries ‘elitism’ it should be remembered that they’ve been free at all points to get involved throughout the nearly year-long run-up to the ballot – if they can ever get away from serving customers, ordering stock and doing their accounts. Perhaps the rather plush environment was entirely in keeping with the tone of Harrogate BID. No one is saying Harrogate is struggling. The town centre is still successful. The point of BID is to ensure it stays that way.